Linheraptor life reconstruction. Courtesy of Matt van Rooijen. Cast of the Linheraptor holotype. Yes say hello to Linheraptor exquisitus a new dromaeosaur from Bayan Mandahu. As the name suggests the preservation on this thing is absolutely incredible. Great through the specimens often are from this formation, this ranks as one of the best yet. Not only is the condition really good but the specimen is almost entirely complete and articulated. Some bits of the skull have gone, some of the tail and the furcula, one of the legs has a nasty surface, probably caused by water, but as specimens go, it’s pretty much perfect. It shows off some nice features such as the fenestrae in the skull, uncinate processes on the ribs and flexion of the tail. 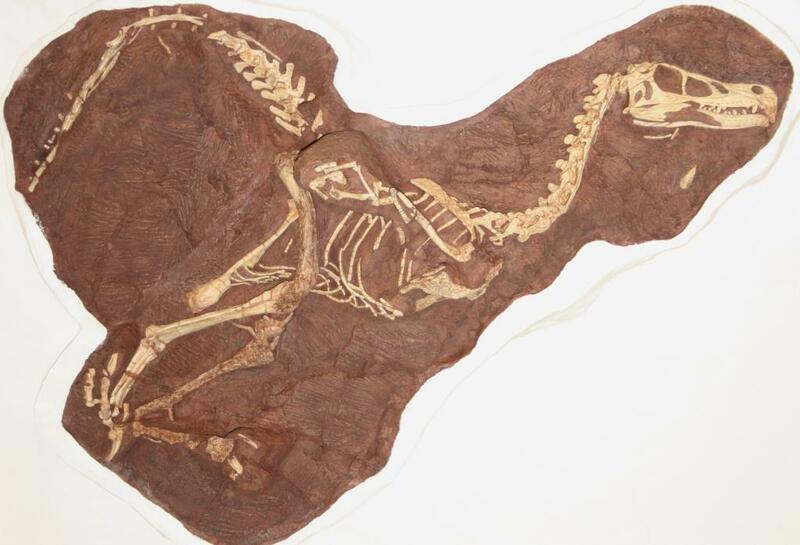 It’s quite large for a dromaeosaur, being about 2 m long which for size and gross morphology puts it right alongside the famous (or even infamous) Velociraptor which is known from beds of the same age just over the border in Mongolia. 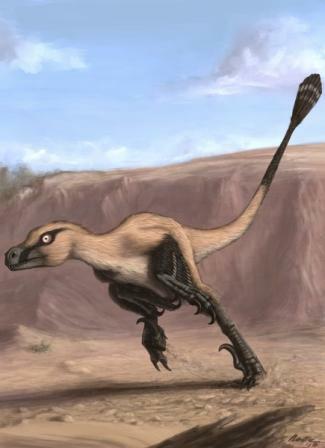 However, Linheraptor has more in common with the less well known Tsaagan from across the border in Mongolia. Tsaagan is only known from a superbly preserved skull and a few neck vertebrae limiting the comparison between the two but there are differences. This makes Linheraptor the fifth dromaeosaur from these beds (and their equivalents) alongside two species of Velociraptor, Tsaagan and Mahakala so the small predators were clearly quite diverse. This initial description and diagnosis is rather short – there’s more work to do on this specimen as preparation continues and new information is revealed. As a result there’s not much more for me to add here than thanks again to Matt Van Rooijen author of the Optimistic Painting blog or his reconstruction at the top. This is Matt’s work, so if you want to use it, contact him. It’s well worth a look, Matt has a cracking little animation showing how he got to the final design via all the draft images. Xu, X., Choinere, J., Pittman, M., Tan, Q., Xiao, D., Li, Z., Tan, L., Clark, J., Norell, M., Hone, D.W.E., & Sullivan, C. A new dromaeosaurid (Dinosauria: Theropoda) from the Upper Cretaceous Wulansuhai Formation of Inner Mongolia, China. Zootaxa, 2403: 1-9. Is there a copy of the paper floating around just yet? Saw it ‘in press’, but not sure if that applies to the internet version. It’s out. Sorry, that reference I took from my CV hence the ‘in press’ aspect. I’ll add the full ref now. If anyone finds/has a full length version, I’d be happy to see it. True… (and will :-). I just found out about the critter, and so decided to check on Zootaxa’s website first. Wow, gorgeous specimen! I’m confused though about the Wulansuhai Formation: can’t seem to find info on this unit elsewhere. Is it equivalent to the Bayan Mandahu Formation, or a subunit, or something? As i understand it(since I normally try to stay well clear of geological sections) the Bayan Mandahu gate locality was always considered part of the Djadokhta formation in Mongolia (that has Velociraptor, Protoceratorps, Tarbosaurus etc. in both). Recently it was reclassified as it’s own formation – the Wulansuhai but this is considered equivalent in age to the Djadokhta. So the two are effectively synonymous (same age beds of the same time and same type containing the same taxa) but have different names since the two are quite a distance apart. Oh my gosh, what a beautiful specimen! The skull shape seems very reminicent of Velociraptor. I’m no expert at all but this thing looks too similar to Velociraptor, and so does Tsaagan. Are you 110% positive that it is a new genus? Couldn´t they be just new Velociraptor species or even just good ol’ Velociraptor mongoliensis with individual variations, or something? I just find it funny that so many predators so similar to each other were coexisting, when in nature today you rarely see too similar predators in the same habitat. Or am I missing something? Well there’s several things here – yes they do look similar, but we do document in some detail the differences between Linheraptor, both Velociraptor species and Tsaagan. But that’s no surprise – they are close relatives – strip off the skin and muscle and all the big cats look pretty similar, so too do the various wolf species or a great number of small passerines. The devil is in the details and I suspect you don’t know the anatomy well enough to spot them (site down with good photos and descriptions and they’ll soon become apparent). However, in a sense your point is right. Taxonomy is subjective – one researcher’s species is another’s subspecies and another’s genus. However, we don’t name new taxa friviously and most taxonomy operates by consensus since most researchers in a given field have a fairly good grasp of what is and is not a species. I’m not up on the details of the variation and patterns of changes in dromaeosaurs but it’s generally best to give the benefit of the doubt to the people doing the detailed work and i do trust Xu Xing and Mark Norell to spot a new genus when they see it, and of course good refereeing and editing to cover the manuscript. As for the question of multiple forms in one environment, there are possibilites here. After all, lions, tigers and leopards all overlap in India for example, and there’s a whole mess of smaller cats in Asia and South America that overlap. But even with very similar morphologies, they can still specialise in different ways. It’s all hypothetical of course, but in the case of the dromaeosaurs, one might be hanging around the rivers at Bayan Mandahu, one goes into the deep desert, one goes for juvenile dinosaurs and one for small lizards and mammals etc. That would keep them from all overlapping in terms of prey / environment too much while all living within an area of a few hundred square kilometers. It’s all plausible and possible based on what we see on extant analogues and don’t forget, two of these taxa are based around skulls – they might have rather different postcrania for example, or our aging of the beds might be out slightly and the two Velociraptor species could be chrono-species for example. There’s always the chance we’ve got this very wrong and that’ll turn up later with more specimens that show a continuum where we thing there’s discreet changes etc. However, for now it’s pretty solid and doesn’t violate any taxonomic rules or biological principles and there’s lot’s of possibilities as to how this taxonomy might reflect genuine diversity. Besides agreeing with all the gushing over the great specimen, I’d like to mention something that’s been developing into a peeve for me lately: whenever someone is asked “how large is it?” about a new dinosaur, they tend to give a length, including the tail. But to most laypeople, this makes it sound larger than it is, because we’re used to looking at mammals with their skinny, down-hanging tails that don’t add much to the apparent length. Giving a height at the shoulder would be much more informative. Hi Vasha, good point. As it happens I’m working on something like this myself at the moment. I actually did an interview for a newspaper that was not published and I specifically gave them a height to the shoulder and height to the top of the head as well as the total length. I agree it gives a better understanding of the size of the animal, but sadly few others do. Could you give the height here? I’m tremendously interested in this, I’ve always dreamed of finding a larger, ‘Jurassic Park’ like velociraptor. I would like to know exactly how much bigger this Linheraptor was. Hi, I don’t have the numbers to hand and obviously the specimen is in China and I’m in ireland. But this was, essentially, the same size as Velociraptor and would be about 1 m or so to the top of the head when standing normally. Hi, this new scientific research is very, very interesting! How many time did you take in pickup, of the skeleton? Although I was part of the field crew when Linheraptor was discovered, I was not on of the people who excavated it. However, as I recall, it took about 5 people 2 days to get the piece out of the ground and then several more months of careful preparation to reveal the bones. As for further details, the paper currently deals with just the anatomy and classification. While we will be doing more work on the ecology etc. it is not published so I don’t want to talk about it yet. Thank you David for your explanation. So this paper is advocating the Limusaurus frame-shift? That’s an awfully big assumption, especially since the arm and hand are barely prepared in Linheraptor. Besides, I have yet to see the Limusaurus authors respond to criticisms that Limusaurus’ hand is merely a typical stubby ceratosaur hand, and not indicitive of some grand frame shift. It’s just odd to see that position trumpeted again, especially when it just seems thrown in. Not really. All the bones of each of fingers are visible in Linheraptor. In any case the Limusraurus hypothesis basically postis that IF that is correct, then all more derived theropods are II-III-IV. As I noted way back when (https://archosaurmusings.wordpress.com/2009/06/23/limusaurus-confusion/) this statement is basically essential as if we don’t declare which hypothesis we are going with the the identity of the digits are ambiguous. 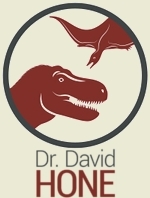 This way, if you disagree with the Limusaurus hypothesis you can just call them I-II-III. But at least you *know* to do that. Well, A0 those criticims were just in an advanced online review, not a paper. And secondly we did respond, but then the same site had a screw up and took our reply down. In any case, until both have been fully thrashed out both are viable hypotheses and hence it is essential to provide clarification, no matter which is used. What’s the big deal? We do provide lots of evidence in the Limusaurus paper (not least an actual physical specimen as opposed to hypothesised transfers and one that is homologous with the embryological data -that’s pretty good support), it’s not like we just made it up untested and unsupported. It’s not being trumpeted, it’s being used to clarify. I gotta agree that using the II-III-IV digital homology in theropod descriptions now is premature. It’s an interesting hypothesis, but until it’s actually the consensus, it just creates confusion. Too much of descriptions and character lists depend on digital identifications, so us readers have to constantly remind ourselves who a paper’s authors are and thus what digit is being described at any given time. The Haplocheirus paper even used I-II-III for parts of its text, and II-III-IV for others. But that really shouldn’t be an issue. The fact that the paper clearly and simply states which is being used eleminates the problem. I think Xu (as the author of the Limusaurus stuff and of course taking the lead here) is well within his rights to want to describe stuff using his hypothesis. I don’t know his mindset, but if he thinks I-II-III is wrong and II-III-IV is right, (and I’d say the evidence favours the latter, though I agree it’s far from absolute) then i think he’s well within his rights to want to base a description on what he thinks is correct. I agree it’s far from perfect but for example, the Benton vs Gauthier definitions of archosaurs still continue in parallel without much confusion. Those discussing them simply state which hypothesis they are using. As I say, if anything this is really not hard to mentally ‘fix’ if you don’t like it. Just transpose every digit over one. But I think it’s wrong to impose this on an author without good reason. I mean some people still get to describe birds as not dinosaurs in their papers based on far less, and people are constantly using different definitions of various taxa. It’s not helpful sure, but it’s also the nature of the beast – until things are settled there are often differing opinions or unequivocal definitions. In this case it’s a pretty minor one I think. You don’t have to like it, but I don’t think you can, or really should, stop an author doing something like this. Okay, Dave, I figured out why I don’t like that sentence. First, it just doesn’t belong in the paper. It is a singular shout-out to a questionable conclusion made in another paper. The finger homology has nothing to do with this initial description. Maybe if you wanted to line up a bunch of raptor hands and make a convincing argument about finger homology, sure, but to mention it in passing here is awkward and, I believe, unnecessary. Maybe that’s an unfair comparison, but I think the point is the same. If you see that, and see that the reference is–hey, look–a Martin paper, you’d immediately think, “Yeah, THAT’S unbiased.” That’s the feeling I’m getting here. No, it’s essential you make it clear where you are coming from. As I say, even if we did go with I-III we should still explictiyl state this in any case to make it clear. According to you, not to the author, hence he should be allowed to say it if he wishes. It’s untested yes, questionable, I don’t think so. As for your example, that is, to my mind, exactly the point. It matters not if the point from Xu is biased, (or Martin) the point is that it is clear and unambiguous *exactly* what is meant. Sure, you don’t think they are collagen fibers, fine. But you can check Martin 2006 to see what they say, and you know that feathers are the obvious alternate. You can still read that sentence and go, “Well, I think they are feathers so I’ll treat them as such while reading this paper”. You can do the same thing here “Well, Xu’s wrong about this II-IV busianess, so when he says digit I, I’ll think digit II”. So in fact, this is the right thing to do. The *wrong* thing to do is describe it as II-IV or I-III without saying which or why. I-III might be considered to be the ‘right’ one or the ‘default’ or the ‘best’, but II-IV is not wrong (yet), and is viable. It can be used and has been used. No harm, no foul. It might annoy or irritate, but it’s correctly used. And I think the point about bias is misleading. Everyone but everyone has biases about some things – it’s human nature and the fact that not all things are clear. You can hardly complain that authors favour their own ideas.